Unngå hovedlinjer på State Hermitage Museum i St Petersburg for å se sine mest kjente kunstverk på denne 3-timers tur. Med en kunstelskende guide får du rask oppføring, og fra mai til september får du privilegiet om tidlig tilgang, og starter din tur i et publikumfritt miljø. 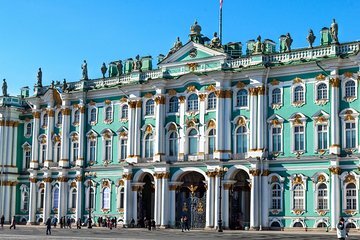 Møt din kunstekspertguide på Palace Square i sentrale St. Petersburg, og spasere til det nærliggende State Hermitage Museum, som ligger i det overdådige Winter Palace. Underveis, høre hvordan Hermitage ble etablert av Katarina den Store i 1764, da keiserinne kjøpte 255 dyrebare kunstverk, frøene til museets nå spektakulære samling. I 1852 åpnet Hermitage åpnet for publikum, og er nå et av verdens største museer, med mer enn tre millioner gjenstander. Inngangslinjer kan være lange, slik at du kan hoppe over vente linjene og nyte rask opptak til museet sammen med din guide. Hvis du besøker mellom mai og september, gir du billetten deg rett til tidlig tilgang til museet, slik at du kan gå inn med guiden din for allmennheten, og begynne å utforske skjermene i en mengdefri atmosfære. En gang inne, drikk i de forgylte kamrene og høre hvordan museet strekker seg over fem bygninger, inkludert Vinterpalasset, hjemmet til Russlands tsarer fra 1760 og fremover. Din 3-timers tur slutter når guiden din avgår. Deretter kan du enten forlate Hermitage eller fortsette å utforske sine skatter uavhengig - billetten gir deg hele dagen tilgang til museet. Vær oppmerksom på: Mens din oversprettbillett gir deg tidlig tilgang til Hermitage fra mai til september, er privilegiet underlagt museets offisielle godkjenning. We were in a small group (4) for our tour of the Hermitage and we were grateful for that. Our guide had a wonderful knowledge of the Winter Palace, the Hermitage and the various and extensive collections on display. It was well worth it. We booked our group tour one day in advance. We arrived early, met Margarita and waited for other booked participants. None arrived, so we were off on a private tour! I had visited The Hermitage 40 years ago, with no guide and one hour to visit. We had “early entry” and Margarita immediately lead us to empty rooms which would shortly be packed with visitors. She knew the strategy for having the fewest tourists near the for exceptional viewing access. Beginning with the initial highlights she tailored additional rooms and exhibits as she learned our interests and preferences. A thorough tour in three hours of the Winter Palace, Hermitage and connected buildings. We next visited the General Staff Building, beginning with coffee in the cafe. The next 1 1/2 hours we focused on the extensive Impressionist Galleries and several special exhibit galleries. I am fairly familiar with that era and was thrilled that Margarita has extensive knowledge of this specific collection. She is an exceptional guide and I highly recommend her. It was a very well-chosen, comprehensive route, Eugene-a very good, professional guide, with solid knowledge of art, passionate and sure of him. It was an excellent time spent, which will keep our Hermitage in memory for all our lives. Thanks to Eugene, thank you "Marina Wilson Private Tours". We are regular museum goers whenever we travel and wondered why we should take a tour at The Hermitage. Honestly I don't think we would have survived our first hour there without this amazing tour. There are thousands of people in the galleries and you will be guided through the crowds to most of the major art works. Our guide was very well informed, kind, patient and full of great stories about the art. Don't hesitate. An excellent tour, and well organised in terms of meeting point, contacting me etc. Tour guide Valeria was excellent - very patient and knowledgeable. If you want to have a focussed visit of the highlights of the Hermitage, book this without any hesitation. Otherwise it's so huge you may miss the best parts. Highlight recommended. This small-group tour of the Hermitage was one of the best group tours I've had. Our guide was so incredibly knowledgeable and she was patient with us taking photos and needing to take a quick break for coffee. This was definitely worth the money to spend! We took this tour with a guide that only takes very small groups of 8 people and it was very good. the Hermitage is a Museum that you cannot miss if you go to St Petersburg it is an absolute must. The great advantage of a small tour is that you actually get to hear what the guide says! Our guide, Marina, a joy. She was enthusiastic, not averse to answering questions of any sort, has her own opinions and is delightful to watch as she throws her arms around, pirouettes and points! We were a group of 4 only and the Heritage is a large building but we managed to see a lot, and understand the nuances of Russian history. For me, the art was okay very European ..but the history is fascinating. I strongly Recommend a small tour anytime!